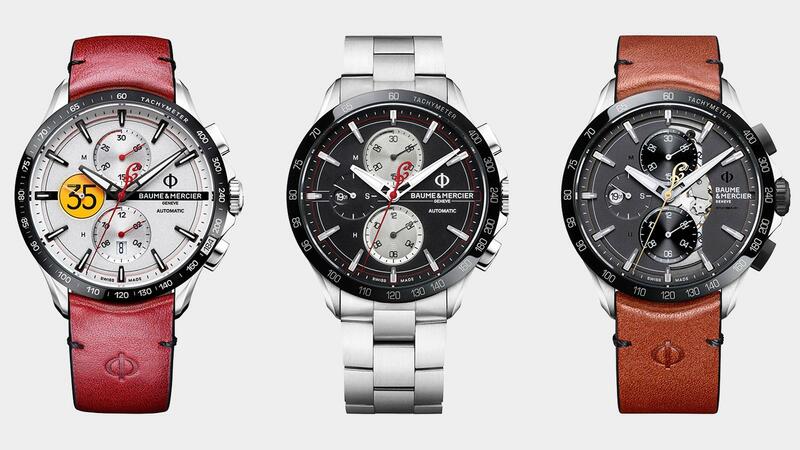 Last November, Baume & Mecier introduced the 44 mm Clifton Club Burt Munro Tribute Limited Edition (left). In January, they expanded the lineup with two models named for Indian’s popular bikes, Chief (center) and Scout (right). At this year’s Salon international de la Haute Horlogerie (SIHH) watch fair in Geneva, Baume & Mercier displayed Indian Motorcycles’ Spirit of Munro, a one-of-a-kind, custom-built streamliner unveiled in 2013 along with the company’s Thunder Stroke 111 engine. The red aluminum, rocket-like bike with the numbers 111 painted on the side was a faithful tribute to New Zealander Burt Munro's Munro Special, the 1920 Indian Scout that hit 184 mph to break the under-1000cc land-speed record in 1967 at Utah’s Bonneville Salt Flats. Baume & Mercier showcased the bike to make a bold statement about its new partnership with America’s first motorcycle company, co-founded in 1901 by George Hendee in Springfield, Massachusetts. Last November, Baume & Mecier introduced the 44 mm Clifton Club Burt Munro Tribute Limited Edition ($3,900) at Milan’s EICMA motorcycle show. Limited to 1,967 pieces, denoting the year of Munro’s achievement, the automatic chronograph is powered by a workhorse Valjoux 7750 movement. Most prominent on the dial is the number 35 encircled in yellow, just as it appeared on the side of the Munro Special, and the same goes for the horizontal black bar. Indian’s hallmark cursive “I” anchors the red second hand and the tachymeter scale highlights the number 184. A deep red Horween leather strap matches the bike’s paint color and the company’s signature shade, while the Indian logo and edition number are engraved on the case back. In January, Baume & Mercier expanded the Indian Legends lineup with two models named for Indian’s popular bikes, Scout and Chief. Both watches are powered by the automatic Valjoux 7750 movement with a 48-hour power reserve and are limited to 1,901 numbered pieces. The 44 mm Clifton Club Scout ($3,900) in polished and satin-finished stainless-steel with ADLC details features riveted indexes with hours and minutes treated with luminous green SuperLuminova, while the chronograph sub-dials mimic the bike’s speedometer. The beige seconds hand has Indian’s stylized “I” as a counterweight and the date window displays 1901 on the 19th of each month in a nod to the year the firm was founded. The partially open-worked opaline grey dial with black snailed counters reflects the shade of the bike’s body, while the rich brown Horween leather strap matches the color of the Scout’s seat. Clifton Club Chief ($3,900) is also 44 mm, but is fitted with a three-row, stainless-steel bracelet with satin and polished finishes. A tachymeter scale encircles the black dial with riveted indexes that take inspiration from the lines of the Thunderstroke 111 engine. Like the Scout, its date disc is marked with 1901, the red chronograph seconds hand is tipped with the cursive “I,” and the case back is engraved with the piece’s number and the Indian Motorcycle Headdress logo.